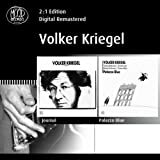 Volker Kriegel's follow-up to "Spectrum" is a double album and a much more dynamic affair and more to my liking. He has some of the best German and British musicians around helping him out. It's interesting that the first LP has a different lineup than the second LP. The first LP has an eight piece lineup and was recorded on the 20th & 21st of March, while the second LP featured a five piece band and was recorded on the 22nd & 23rd of March. The most well known name for me is John Marshall on drums on the first LP. Lots of pictures in the liner notes and John is as usual very serious looking. "Slums On Wheels" has such a great sound to start as the sax joins in. Intricate guitar then takes the lead as it settles some.The sax is back then the tempo picks up before 4 1/2 minutes. A calm 6 minutes in as intricate sounds come and go. It's building before 9 minutes and electric piano joins in. Nice. Bass and percussion continue. Sax before 10 1/2 minutes. Drums only from Marshall before 12 1/2 minutes then a full sound. What a way to start ! "The "E" Again" has a good rhythm as sax and guitar do their thing. Dissonant sax before 2 1/2 minutes. Electric piano leads a minute later. Sax is back before 6 1/2 minutes to end it. "Zanzibar" is led by the bass and drums early then the horns come in just before a minute. The guitar then leads before the horns return before 3 1/2 minutes as it picks up. Some dissonance too. A calm before 5 minutes as bass and a beat with horns lead. It kicks back in before 6 1/2 minutes. Piano leads before 8 minutes and we get some nice bass a minute later. Sax is back 10 minutes in. "Missing Link" opens with experimental sounds that come and go including vocal expressions. The music comes in after 2 minutes and starts to build. I like the drumming here. The horns start to blast then it settles back. A calm 5 minutes in then it starts to pick up with guitar leading the way. Nice. Horns take a turn before 7 1/2 minutes with lots of dissonance too. A drum show from Marshall 9 minutes in. Great sound before 11 minutes with sax leading then guitar. Killer tune. The second LP is a little more stripped down but excellent none the less. "Fur Hector" is uptempo and guitar led. Piano takes the lead after 3 1/2 minutes.The guitar is back leading late. "Remis" is percussion and keyboard led early and the bass is prominant too. The guitar then joins the fray. "Tarang" has a Middle Eastern vibe to it with lots of percussion. Strummed and intricate guitar comes in at 2 1/2 minutes before the opening ethnic soundscape returns to end it. "Lastic Plemon" is led by the drums and keys and is quite energetic. Guitar before 3 minutes. "Janellias Abertas" is an intricate and laid back track. "Plonk Whenever" is uptempo with the bass and drums pounding while the guitar and keys play over top. Great track. "Definitely Suspicious" is one of my favourites. It has such an uplifting mood to it and the electric piano has a lot to do with that. "Finale" is 15 seconds of mainly intricate guitar to end it. A solid 4 stars. Very enjoyable and a treat for the ears. 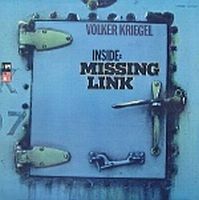 Post a review of VOLKER KRIEGEL "Inside: Missing Link"